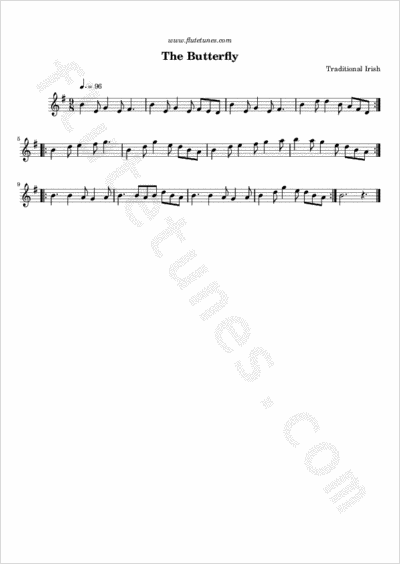 The composition of this slip jig is usually credited to the late fiddler Tommy Potts, who knew the first two parts of the tune from his father, Sean, an Uilleann piper. As the story goes, Potts was working in his garden one day when he noticed the erratic flight of a butterfly flitting about. Intrigued, Potts tried to mimic the rhythm of the insect while he continued to work in the garden, and was inspired to come up with the third part of the tune. The first two existing parts were then altered rhythmically to fit. The tune is also known among Highland bagpipers as “Skin the Peelers”, peeler being an old slang term for a policeman.